Resistance Band Training is perfect for senior fitness enthusiasts for several reasons. However, without a proven Senior Band Training Blueprint to follow, it’s difficult to develop early training success. Why Train with Bands as a Senior Fitness Enthusiast? 1. A band’s light weight portability makes it easy to strength train, anywhere. Therefore, exercising at home, versus having to go to a gym, becomes a very achievable option. 2. The ability to attach a band and perform exercises against a horizontally directed resistance is going to be more joint friendly. This is because it eliminates having to load the spine, knees and hips with vertical compressive forces that come with lifting weights. As a result, strength training with bands using horizontal forces becomes a more sustainable exercise option. 3. Senior band training provides active aging adults with the ability to apply resistance to “real world” movements like forward walking, side walking, step-ups and even controlled stationary running. Maintaining optimal strength, balance and coordination with these movements is key to maintaining a high level of “real world” movement control as the body ages. 4. A single resistance band has a resistance variability of 30 to 40 lbs. If the bands are linked together this resistance variability increases to over 60 lbs of variability. With this level of resistance variability it allows seniors to safely exercise with an optimal level of resistance regardless of the exercise. 5. Lastly a band is soft. Therefore, there is no concern with dropping a weight or having to hold a weight for an extended period of time. This can be an obstacle to achieving a good workout for a senior fitness enthusiast. There are two band set-ups that I find are the most senior friendly when it comes to learning how to safely train with bands. Both of these set-ups increase the length of the band training system. This in turn increases resistance variability as discussed above. As a result, these set-ups make it easier to exercise with a safe and optimal level of resistance. This is not going to place the body at risk of injury if resistance becomes too great with fatigue. In training 100’s of active aging adults over the years, I have identified the best 14 attached band exercises to implement first when starting a senior band training program. The key to senior band training is making sure you can perform a full range of motion with each exercise. To do this you will need to have a high level of balance and core stabilization. Here are 5 ways to modify an exercise to ensure balance, core stabilization and full range of motion are at optimal levels. Any band exercise can be modified to fit any level of senior fitness. The key is to successfully master each exercise or movement first using a band resistance. That ensures balance and full range of motion is able to be optimally maintained. Applying this plan, senior band training will be successful. Attention … Want to Get Complete Workouts, Programs and Exercise Instructions?? The Band Gym is the only online community exclusively dedicated to training with resistance bands. 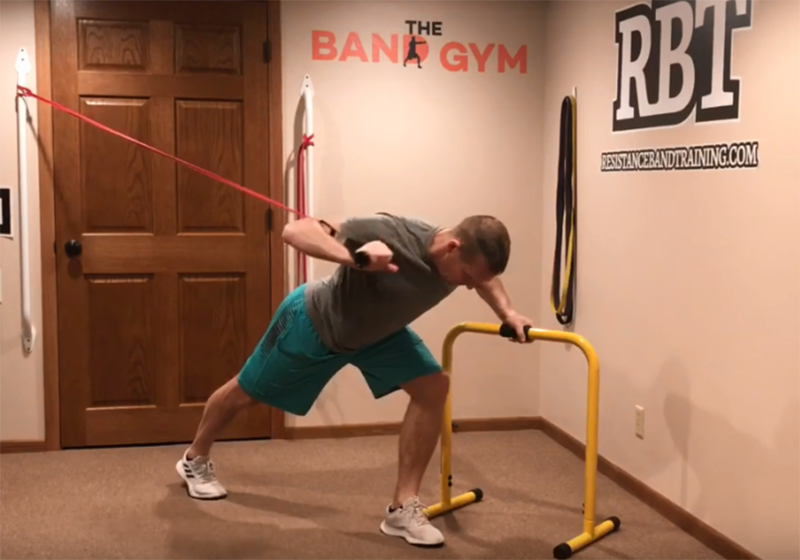 Any active aging adult, including seniors, can access online workouts, programs and coaching from Dave Schmitz to assist them with learning the safest and most effective ways to get better with bands.